Purchase a Radiance Pro and get our advanced auto-calibration package with meter for only $280 (or $200 without meter). A savings of up to $500! Available for a limited time only. We ship worldwide, but cannot ship to the UK, Italy, or Australia due to exclusivity agreements. Contact us to purchase standalone Radiance Pro 18 Ghz input or output cards. Limited supply of open box and pre-owned units available. Trade-ins also available. Contact us for complete details. NEW LOWER PRICE. LIMITED QUANTITIES AVAILABLE. Radiance 424X, 21X3, XS, etc. older Radiance 444X, 21X4, XD, XE, etc. Must be purchased at the same time as a Radiance. Radiance 21xx and Radiance Pro 444x only. Must be purchased at the same time as a Radiance Pro. Contact us for after market upgrade prices and installation instructions. Must be purchased at the same time as a Radiance Pro. Contact us for after market upgrade prices and installation instructions. Two outputs are affected: One is upgrade to 18Ghz audio/video while the second remains audio only. Must be purchased at the same time as a Radiance Pro. Note: We only sell the latest Rev.B meters with extended dynamic range hardware (certified to 2000 nits). We ship worldwide. Contact us with any special needs or questions. A tracking number is included on all orders. International orders typically ship DHL or USPS International Express. All units have a 30 day return policy with 10% restocking fee. We've worked out a deal for our members to bring you these products at the lowest prices possible. Orders ship direct from the manufacturer at our CurtPalme.com discounted prices. Same product, same support, just more money in your pocket at the end of the day. The Radiance with HDMI 1.x and HDMI 2.0 actually processes the 3D, and does not just pass through 3D like other scalers such as the DVDO Duo. The Radiance can scale, crop and calibrate your 3D sources (Blu-ray, PS4, etc). All included in one price. The Radiance regarded as the world's best video processor/scaler, with a powerful Colour Management System and image enhancement technology. The Radiance Pro 44xx series is available in 1U (1.75") height. The 2U (3.5") height has been phased out. For complete details on the differences, see our feature comparison table below. What makes the Radiance the best video processor? For complete details on which models support which features, see our feature comparison table below. With all of these features, the Radiance provides much of what you get from a high-end home theater receiver without the amplification digital sound decoding. However, what makes the Radiance truly special is the full set of video calibration controls it also offers. The Radiance is the best way, and in some cases the only way, to achieve an optimal theater setup. Boasting multiple video and audio input options, the Radiance functions as an extensive central switching hub, providing home theater system video quality that will satisfy the most demanding enthusiast. The HDMI inputs accept resolutions of up to 4K UltraHD (2160p at 60 Hz). Component inputs accept resolutions of up to 1080p at 60Hz. Audio input can accompany the video on one of the HDMI inputs, or use analog stereo pairs, coax or optical audio inputs. Component inputs can be combined with a composite to support SCART RGBcvS video sources. The HDMI outputs can be a copy of the first output, or they can be used as an audio only output to send audio to receivers that do not support 1080p60 or 4K UltraHD for their HDMI inputs. Audio output is supported on the HDMI connections plus COAX audio outputs. Radiance models include integrated Darbee DVP™ image enhancement technology. All Radiance models include setup and calibration features include multi-point linear-Gamma RGB color palette CMS (up to 4913 points), 21-point parametric gray-scale and Gamma, a host of setup features, Lumagen’s industry leading No-Ring™ scaling technology, and support for 3D scaling and conversion between 3D formats for displays and projectors that do not support all the common 3D formats. 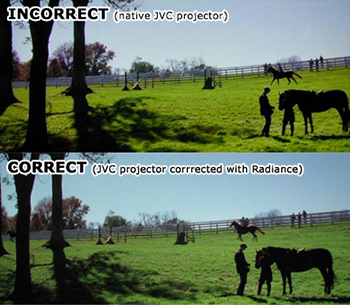 The Radiance offers 10-bit on the front end and 12+ bit processing in the calibration pipeline, including per-pixel standard definition (SD) and high definition (HD/UltraHD) video de-interlacing with adaptive diagonal filtering, edge enhancing scaling technology that does not add ringing (unlike competing products), plus MPEG mosquito and block artifact reduction. Finally, an important image quality feature is temporal noise reduction for both SD and HD/UltraHD sources. Other Radiance key features include user-adjustable image enhancement, including four configuration memories for each input, a programmable output resolution from 480p to 2160p, plus 1080i; the ability to zoom in on any source by up to 33 percent; selectable aspect ratios of 4:3, 4:3 NLS, 16:9, 1.85, and 2.35. The 4:3 NLS aspect ratio uses Lumagen’s Preciseview user programmable non-linear-stretch mode to allow the user to program exactly how 4:3 sources fill a 16:9 display. For film sources 2:2, 3:2 and 3:3 pull-down detection is supported to allow for correct cadence output at 24, 48, 60 and 72 Hertz for 24 fps film sources, plus 50 and 75 Hertz for 25 fps film source. Complete 3D processing: The Radiance with HDMI 1.4 and/or HDMI 2.0 actually processes the 3D, and does not just pass through 3D like other scalers such as the DVDO Duo. The Radiance can scale, crop and calibrate your 3D sources (Blu-ray, PS4, etc). Lumagen over the years has kept up with new features and offered upgrades to existing users more so than any other manufacturer - often through completely free software upgrades. Most other companies we know of do not do this. Instead, they make you buy a new model as new features are introduced. The Radiance is completely over engineered with processing power that has proven that it can take on just about anything. A standard feature of all of the Lumagen video processors is the use of a FPGA (Field Programmable Gate Array). This allows Lumagen to add new features by reconfiguring the hardware connections inside the video processor. This is in addition to the normal software update for the microprocessor. This is what makes the Lumagen Radiance video processor a better value than the competition. They have the ability to add major new features, such as support for 3D video which was added for free when it first became available. The new modular I/O technology on the Radiance Pro series takes this one step further and allows upgrading to new HDMI technology as it becomes available (such as 18 Ghz / HDR support). Truly phenomenal support from Jim Peterson and his crew. Now available: Darbee Visual Presence™ technology provides an exceptional increase in depth and detail for all display types on a per-input basis (allowing you to use different amounts of enhancement per source). The better and more detailed your source signal is, the better the resulting picture will be. For complete details visit our Darbee page. Until now there was always one weak link in the chain of video calibration. If your display lacked the proper set of calibration controls, it simply didn't matter if you had an extremely accurate meter and the world's greatest software. Without the means to adjust the image, you could not improve the display regardless of the calibration equipment you used. The solution to this problem is the Radiance that provides the necessary adjustments that you could place in between the source material (broadcast, DVD, or Blu-ray) and the display. Up to 4913 points of automatic calibration are available, ensuring the most accurate picture possible. Comprehensive set of video test patterns. 5% or 10% grayscale/gamma adjustment. Full 3D color management, offering adjustments to the brightness, hue, and saturation of all of the primary and secondary colors. These may be adjusted manually or by using ChromaPure Auto-Calibrate which allows anyone with little or no training in video technology to fully calibrate their display with almost no user input. Just setup a few simple options, click Auto-Calibrate, and then just go have a cup of coffee while the process completes, usually in less than 10 minutes. The Radiance is more powerful than the iScan Duo. It offers more test patterns and provides the option to perform grayscale and gamma calibration in 5% or 10% increments as well as (up to) 4913 point autocalibration instead of only 6 point. The Radiance also outputs true 3D signals, so it is ideal for calibrating displays in 3D mode. Add ChromaPure video calibration software with the auto-calibrate add-on and a high quality color analyzer, such as the Display 3 PRO and you have the ability to achieve professional-quality results with no training or expertise in video calibration. Why do I need a Colour Management System (CMS)? This is not something that affects only cheaper or incorrectly manufactured displays. Displays at all price ranges are affected, from PC monitors to expensive high-end home theater projectors like the JVC shown above. The only way to fix these deficiencies on displays such as these that do not include a CMS is by using a video processor like the Radiance. There is a lot of confusion on the market today as to how various products approach doing CMS. The Lumagen Radiance is currently the ONLY consumer video processor that uses a true Linear-Gamma 3D Color Palette (3D LUT) for CMS. (A 3D Look-Up-Table (LUT) maps the source video to a specific color palette on the display and so is often called a 3D color palette). Other consumer video processors do not provide a 3D LUT. Most use a HLS Color/Hue control and calls it a CMS. All HLS “CMS” systems are mathematically incorrect and results in non-linear response when used for calibration. Manufacturers might call their solution a “3D CMS” or a “6-axis” CMS, but it is not a 3D LUT. Every CMS (by definition) must be a “3D CMS” since there are three primaries and so it is at least 3 dimensions. "3D CMS" is a meaningless marketing term used by some manufacturers. For more information on why proper colour calibration is critical to proper movie reproduction, see our extensive ChromaPure Grayscale & Color Calibration for Dummies guide. Learn how to get the best image quality out of any display and more importantly, how to do it yourself. Can I add extra input cards to my Radiance Pro? Yes. The 444X chassis are built to accept up to 8 inputs while the 424X chassis are built to accept up to 4 inputs. All the holes are pre-punched, with blank plates for any uninstalled inputs. For either chassis, if there are fewer inputs than are supported by the chassis, you can add more inputs, up to the max supported by that chassis. Both 9 Ghz and 18 Ghz input cards are available. Each card upgrades two inputs. These additions can be done by the owner using only a screwdriver. Contact us with your Radiance Pro model number for pricing. We always sell Radiance products at the lowest allowed prices. Can I add extra output cards to my Radiance Pro? No. 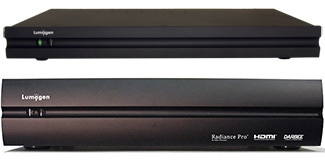 Radiance Pro units all come with fully loaded output card slots. 9 Ghz cards can however be replaced with 18 Ghz cards. Each card contains two outputs. When swapping a 9 Ghz card for 18 Ghz, one output becomes 18 Ghz audio/video while the second output becomes audio only. Contact us with your Radiance Pro model number for pricing. What HDMI cables are recommended? I am now recommending using only "Certified at 18 GHz" cables (certified by VPL labs or HDMI.org, as opposed to just a manufacturer specification). I recommend passive cables that the manufacturer tests and certifies every single cable manufactured at 18 GHz, rather than certification of the "design at 18 GHz" since cables can vary due to manufacturing tolerances. This insures each and every cable is going to work at the full certified 18 GHz rate. I recommend an active HDMI cable for lengths over 3 meters. I do not recommend installing passives over 3 meter to help minimize the chance of a HDMI cable related call-out. Monoprice 18 GHz certified passive HDMI cables. Note: Passive cables under 1.8 meters (6 feet) are not recommended. RUIPRO fiber HDMI. Inexpensive and works in all known cases. Monoprice 18 GHz HDMI fiber cable. Inexpensive and works in all but one known case. Tributaries Aurora fiber cable. Expensive but works well. Ethereal HDM-GA1 extender with the appropriate passive HDMI cables (up to 15 meters). What is Radiance automatic calibration? Why use Radiance automatic calibration? How does Radiance automatic calibration work? Automatic calibration is an optional add-on to ChromaPure software, and it works in conjunction with a Radiance external video processor. The processor acts as both a test pattern signal generator and calibration device. ChromaPure tells the video processor to display test patterns, measures the results with a meter, and then tells the video processor how to adjust the signal to compensate for display errors. This cycle repeats (often for thousands of test points) until the measured results are as close to perfect as possible. * Not yet implemented in current firmware. Will be added as a future free downloadable update. The Radiance 2020 supports all the features of the Radiance Mini and adds 2 more inputs, an additional output, expanded CMS (729 point instead of 125) and includes Darbee DVP™ processing. The Radiance 2020 features 4x HDMI inputs and 2x HDMI outputs in a 1.7" high by 11" wide by 5" deep case (not rack mountable). The 2020 supports 1080p FullHD output. It does not support 4K UltraHD resolution on the inputs. It features the same video processing quality and includes built in Darbee image enhancement technology, allowing you to adjust the amount of enhancement for each input as with all other adjustments. The Radiance 21xx models were first introduced in 2014. They feature 8x HDMI inputs and 2x HDMI outputs in a 1U and 2U height by 17” wide rack mountable case (with optional rack ears), similar form factor to the (now discontinued) Radiance XS and XD/XE. The 2124/2144 include analog inputs and outputs while the 2123/2143 do not. 4K UltraHD (2160p@60Hz) output resolution is supported by the 2143/2144, while the 2123/2124 support 1080p FullHD output. The 21xx series does not support 4K UltraHD resolution on the inputs. All models features the same video processing quality and include built in Darbee image enhancement technology, allowing you to adjust the amount of enhancement for each input as with all other adjustments. Optional triggers are available on 21xx models and they are programmable. By default Trig1 is on when the unit is on and Trig 2 is on when 2.35 input aspect is selected. If you have RS232 control you can turn the triggers on or off with a RS232 command. The new HDMI 2.0 chips are from Silicon Image and have an internal microprocessor with reprogrammable flash memory. This will allow Lumagen to provide updates when Silicon Image provides a new release and should help to eliminate compatibility issues. Some back story: Before with HDMI 1.X chips each company had to implement much of the HDMI protocols on its own. Often the HDMI specification, or the HDMI chip specifications, left a lot to the imagination. This meant each company had to make independent decisions on how to do their implementation based on incomplete specifications. Now with the internal processor being programmed by the chip manufacturer, and its processor doing virtually all the HDMI compatibility work, issues should be dramatically reduced. Even more so for the Radiance Pro when connected to other products that use the new Silicon Image HDMI 2.0 chips, which many will. The inputs are on "dual input" daughter cards and the outputs are on "dual output" daughter cards. This allows upgrades to be offered when new HDMI technology becomes available. It also allows replacing a single input/output card if there is a surge event that takes out an input/output, rather than the entire unit. The Radiance Pro can have up to eight inputs, and four "processed" outputs. Just as the previous Radiance units have two outputs that can output audio and/or video from the same source, these four outputs also output the same processed video and/or audio stream. Having four outputs allows for a projector, a TV, a Receiver/Audio-processor, and a spare. There can be up to six additional zones of switched (only) outputs on some models. These are independent and give the Radiance Pro up to seven independent zones. This is useful for installers as it avoids the need for a separate matrix switch. An example would be a home with 7 TVs where only 2 will ever be in use at once. Only 2 sets of source devices is therefore required (not 7) which lowers the cost. The Radiance Pro is then used to direct these sources to whichever TVs are in use. The Radiance Pro features much faster switching than previous models as there is no GF9450 deinterlacing chip to have to setup and wait for. A bit of trivia: The powerful FPGA chip used in the Radiance Pro costs more than all of the parts in the Radiance 2020 combined. This and other aspects of the Radiance Pro architecture mean it sits well above the previously top of the line Radiance 2144 in terms of processing power and flexibility for future upgrades. Worldwide shipping is available. Radiance video processors are manufactured in the USA and therefore qualify under the North American Free Trade agreement (NAFTA). "So far I have tested [my] 2041 with the actual set-up of my [old] XS and I was very impressed. The 2041 gives a tad clearer picture than the old XS, even if Darbee Vision is disabled. At low levels DarbeeVision really improves the picture quality without adding annoying artifacts." - Stephan G.